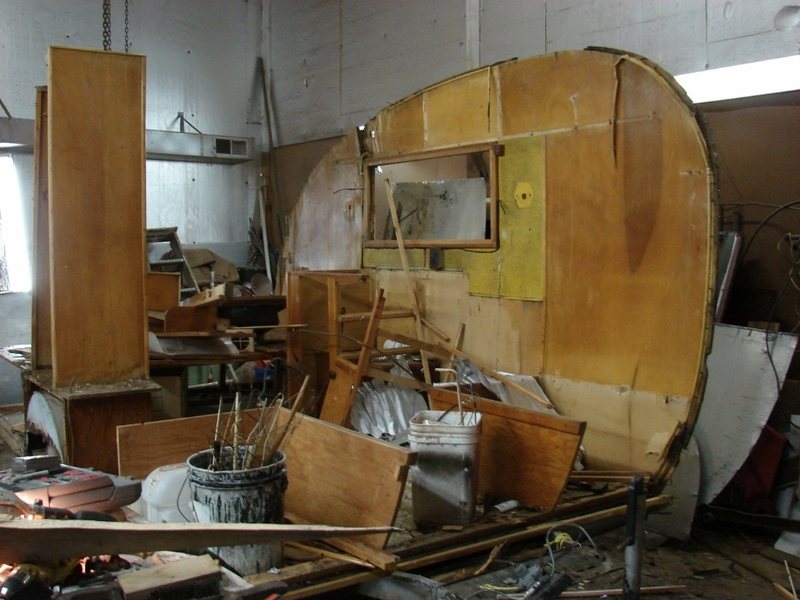 Vintage trailer destroyed by well meaning DIY owner. Area man Brian McCool, in a burst of mis-directed but well meaning enthusiasm, today completely destroyed his wifes 1953 “Tini-Home” travel trailer. In a matter of a few minutes, the trailer was completely demolished, with no other tools than a Stanley flat bar, and a ball peen hammer with the handle taped up with friction tape. Soon, nothing remained but a pile of crinkly aluminum sheeting and some rotten and splintered birch plywood. Smiling amidst the rubble looking quite pleased with the utter destruction of the once intact camper, Mr. McCool explained that his next step involved a credit card (we can only assume it’s NOT his card) and a trip to the local Home Depot for a truck-load of new plywood, some 1×6 and 1×3 pine. Indeed, the roof was peeled of in one big section, after which he kicked the side walls down in a manic fury, cackling with delight. “Now, all that skin there, I’ll save, and use it for a pattern to make the new walls”, he said, “And after that, I’m takin all that ‘luminum to sell fer scrap!”. He said he planned on reconstruction to begin next week, although to this reporter it looked as if it might take at least untill then to clean up the mess. Mr McCool’s father Rex appeared at about this juncture in the demolition, took a look around, shook his head and asked if it might not be a better plan to just strip all the remains from the trailer deck, and use it as a utility trailer. The elder McCool stood silently for moment, shook his head and walked off, muttering something about wasted youth and a will that might need to be re-done, considering the enormity of the folly that his middle-aged son had embarked upon. 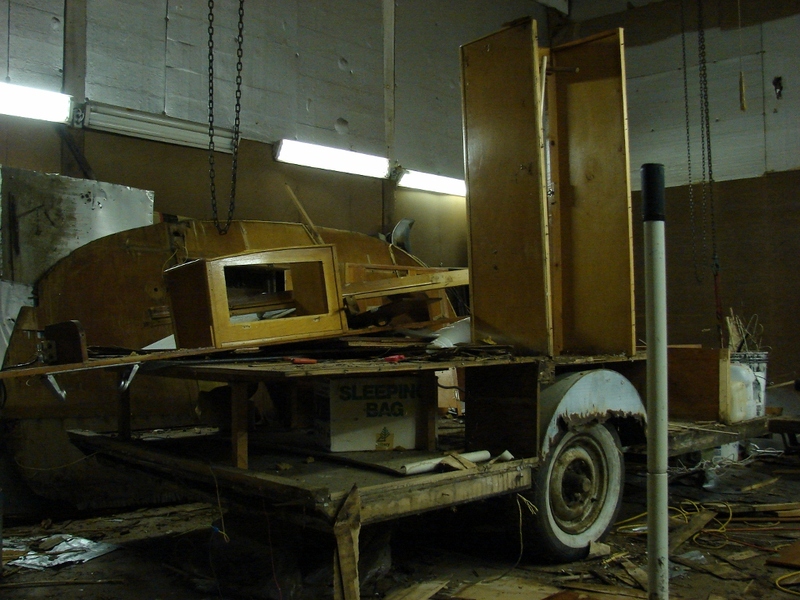 In any event, the demolition continued untill there was nothing left standing on the trailers floor but the closet, front dinette base and sink cabinet, all of which were splinted and seem useable for nothing but patterns. And smell quite bad as well. Undaunted by paternal doubt, public ridicule and potential financial ruin, Mr. McCool surveyed the destruction cheerfully, and was last seen happily heading off towards his car, whistling as he went. Whether or not this project will be completed in time for use this year, or at all, remains to be seen. We will continue to follow this breaking story, as each heartbreaking scene unfolds. Stay tuned for more developments, as they happen. this one should turn out pretty nice! I’m with yer dad on this one!! ………………….just kidding, but it REALLY is a major project. However, your energy and enthusiasm are impressive and I have no doubt this tini-mini will rise again. Buy enough for 2 or 3 more trailers and sell them to the people looking for old trailers. At least you have a truck to haul everything around. It IS a major project, but not one that hasn’t been done before! I would love to have new skins on mine – that is the ONLY thing that hasn’t been replaced on my trailer (besides windows, frame, and wheels). 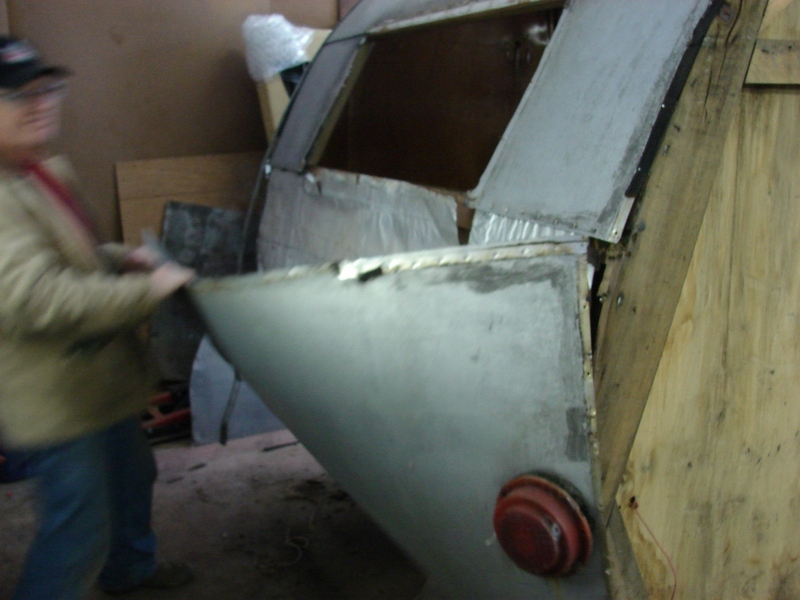 Our Tini-Home, the “Tin Canned HAMB” project starts. 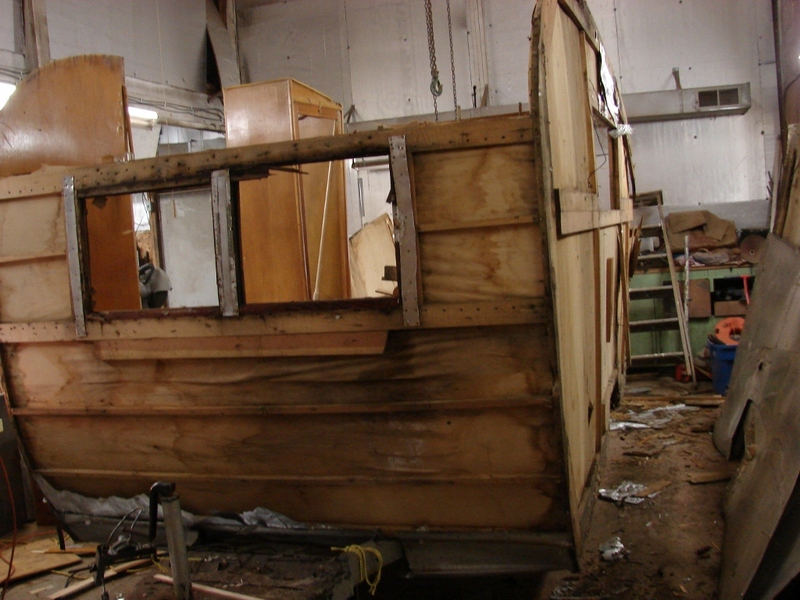 Vintage trailer project, Tini-Home cleanup.